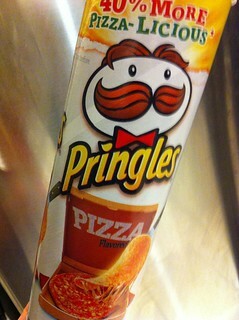 Been on a PRINGLES kick lately for some reason. I am usually NEVER a fan of anything “pizza flavored” when it comes to chips or whatever but these aren’t bad. You get the requisite taste of tomato and cheese flavors so it’s a hint enough to your taste buds to at least THINK of pizza while you are eating them. They just actually made me want a real pizza. Not enough to actually put them down and get a pizza. Oh no….I still stood in the kitchen and ate another 9 or 19 before I finally put them down.